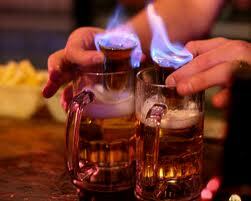 Root Beer Barrel Flaming drink recipe made with Beer,Rum,Root Beer Schnapps,. How to make a Root Beer Barrel Flaming with all the instructions and ingredients. Fill shot glass halfway with Root Beer Schnapps and the rest with Rum 151. Light on fire, then drop into beer. WARNING: This drink can cause serious burns, be careful. Black Velvet View This Recipe! Boiler Maker View This Recipe!